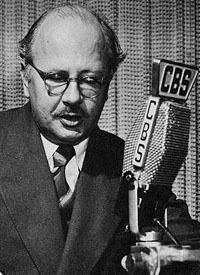 William Lawrence Shirer (February 23, 1904 – December 28, 1993) was an American journalist and war correspondent. He wrote The Rise and Fall of the Third Reich, a history of Nazi Germany that has been read by many and cited in scholarly works for more than 50 years. Originally a foreign correspondent for the Chicago Tribune and the International News Service, Shirer was the first reporter hired by Edward R. Murrow for what would become a CBS radio team of journalists known as "Murrow's Boys". He became known for his broadcasts from Berlin, from the rise of the Nazi dictatorship through the first year of World War II (1940). With Murrow, he organized the first broadcast world news roundup, a format still followed by news broadcasts. 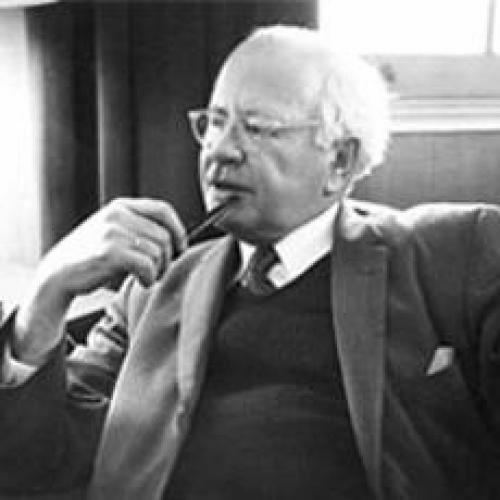 Shirer wrote more than a dozen books besides The Rise and Fall of the Third Reich, including Berlin Diary (published in 1941); The Collapse of the Third Republic (1969), which drew on his experience living and working in France from 1925 to 1933; and a three-volume autobiography, Twentieth Century Journey (1976 to 1990). Born in Chicago in 1904, Shirer attended Washington High School and Coe College in Cedar Rapids, Iowa. He graduated from Coe in 1925. Working his way to Europe on a cattle boat to spend the summer there, he remained in Europe for 15 years. He was European correspondent for the Chicago Tribune from 1925 to 1932, covering Europe, the Near East and India. In India he formed a friendship with Mohandas Gandhi. Shirer lived and worked in France for several years starting in 1925. He left in the early 1930s but returned frequently to Paris throughout the decade. He lived and worked in Germany during the era of the Third Reich from 1934 to 1940. In 1931, Shirer married Theresa ("Tess") Stiberitz, an Austrian photographer. The couple had two daughters, Eileen ("Inga") and Linda. Shirer and his wife divorced in 1970. In 1972 he married Martha Pelton, whom he divorced in 1975. His third (and final) marriage was to Irina Lugovskaya, a long-time teacher of Russian at Simon's Rock College. Shirer and Irina had no children. Shirer lived in Lenox, Massachusetts at the time of his death. As a print journalist and later as a radio reporter for CBS, Shirer covered the strengthening one-party rule in Nazi Germany beginning in 1933. Shirer reported on Adolf Hitler's peacetime triumphs like the return of the Saarland to Germany and the remilitarization of the Rhineland. Shirer was hired in 1934 for the Berlin bureau of the Universal Service, one of William Randolph Hearst's two wire services. In Berlin Diary, Shirer described this move, in a self-proclaimed bad pun, as going from "bad to Hearst". When Universal Service folded in August 1937, Shirer was first taken on as second man by Hearst's other wire service, International News Service, then laid off a few weeks later. On the day when Shirer received two weeks' notice from INS, he received a wire from Edward R. Murrow, European manager of Columbia Broadcasting System, suggesting that the two meet. At their meeting a few days later in Berlin, Murrow said that he couldn't cover all of Europe from London and that he was seeking an experienced correspondent to open a CBS office on the Continent. He offered Shirer a job subject to an audition—a "trial broadcast"—to let CBS directors and vice presidents in New York judge Shirer's voice. Shirer feared that his reedy voice was unsuitable for radio, but he was hired. As European bureau chief, he set up headquarters in Vienna, a more central and more neutral spot than Berlin. His job was to arrange broadcasts, and early in his career he expressed disappointment at having to hire newspaper correspondents to do the broadcasting; at the time, CBS correspondents were prohibited from speaking on the radio. Shirer was the first of "Murrow's Boys," broadcast journalists who provided news coverage during World War II and afterward. CBS's prohibition of correspondents talking on the radio, viewed by Murrow and Shirer as "absurd," ended in March 1938. Shirer was in Vienna on March 11, 1938, when the German annexation of Austria (Anschluss) took place after weeks of mounting pressure by Nazi Germany on the Austrian government. As the only American broadcaster in Vienna (NBC rival Max Jordan was not in town), Shirer had a scoop but lacked the facilities to report it to his audience. 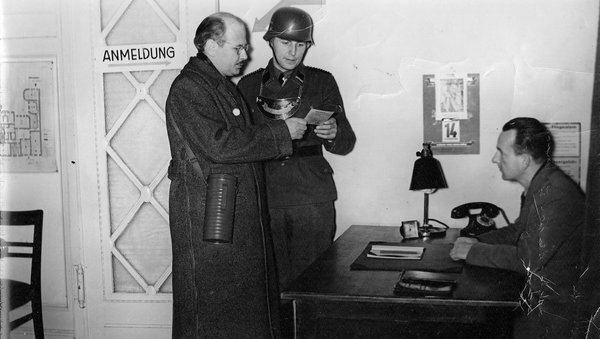 Occupying German troops controlling the Austrian state radio studio would not let him broadcast. At Murrow's suggestion, Shirer flew to London via Berlin; he recalled in Berlin Diary that the direct flight to London was filled with Jews trying to escape from German-occupied Austria. Once in London, Shirer broadcast the first uncensored eyewitness account of the annexation. Meanwhile, Murrow flew from London to Vienna to cover for Shirer. The next day, CBS's New York headquarters asked Shirer and Murrow to produce a European roundup, a 30-minute broadcast featuring live reporting from five European capitals: Berlin, Vienna, Paris, Rome, and London. The broadcast, arranged in eight hours using the telephone and broadcasting facilities of the day, was a major feat. This first news roundup established a formula still used in broadcast journalism. It was also the genesis of what became CBS World News Roundup, still on the network each morning and evening, network broadcasting's oldest news series. Shirer reported on the Munich Agreement and Hitler's occupation of Czechoslovakia before reporting on the growing tensions between Germany and Poland in 1939 and the German invasion of Poland that launched World War II on September 1, 1939. During much of the pre-war period, Shirer was based in Berlin and attended Hitler's speeches and several party rallies in Nuremberg. When war broke out on the Western Front in 1940, Shirer moved forward with the German troops, reporting firsthand on the German "Blitzkrieg." Shirer reported on the invasion of Denmark and Norway in April from Berlin and then on the invasion of the Netherlands, Luxembourg, Belgium, and France in May. As German armies closed in on Paris, he traveled to France with the German forces. Shirer reported the signing of the German armistice with France on June 22, 1940, to the American people before it had been announced by the Germans. His commentary from Compiègne was hailed as a masterpiece. On the day before the armistice was to be signed, Hitler ordered all foreign correspondents covering the German Army from Paris to move back to Berlin. It was Hitler's intention that the Armistice should be reported to the world by Nazi sources. Shirer avoided being returned to Berlin by leaving the press hotel early in the morning and hitching a ride to Compiègne with a German officer who despised Hitler. Once on site, Shirer was able to give an eye-witness account of that historical moment, "I am but fifty yards from [Hitler]. […] I have seen that face many times at the great moments of his life. But today! It is afire with scorn, anger, hate, revenge, triumph." Then he followed proceedings inside the railway car, listening to the transmission relayed to Berlin through a German army communications truck. After the armistice was signed, Shirer was allowed to transmit his own broadcast to Berlin, but only for recording and release after the Nazi version had been disseminated. Shirer spent five minutes before he went on calling CBS radio in New York, hoping that the broadcast would get through. It did. When German engineers in Berlin heard Shirer calling New York, they assumed that he was authorized to broadcast. Instead of sending his report to a recording machine as ordered, they put it on the shortwave transmitter. When CBS heard Shirer's call, he was put on live. For six hours Shirer's report was the only news the world had of the Armistice. In peacetime, Shirer's reporting was subject only to self-censorship. He and other reporters in Germany knew that if Nazi officials in Joseph Goebbels' Propaganda Ministry objected to their reporting, they could withdraw access to state-owned broadcasting facilities or expel them from Germany. Shirer was granted more freedom than German reporters writing or broadcasting for domestic audiences. At the beginning of the war, German officials established censorship; Shirer recalled that the restrictions were similar to wartime censorship elsewhere, restricting information that could be used to Germany's military disadvantage. However, as the war continued and as Britain began to bomb German cities, including Berlin, Nazi censorship became more onerous to Shirer and his colleagues. In contrast to Murrow's live broadcasts of German bombing of London in the Blitz, foreign correspondents in Germany were not allowed to report British air raids on German cities. They were not permitted to cast doubt on statements by the Propaganda Ministry and Military High Command. Reporters were discouraged by the Propaganda Ministry from reporting news or from using terms like Nazi that might "create an unfavorable impression." Shirer resorted to subtler ways until the censors caught on. As the summer of 1940 progressed, the Nazi government pressed Shirer to broadcast official accounts that he knew were incomplete or false. As his frustration grew, he wrote to bosses in New York that tightening censorship was undermining his ability to report objectively and mused that he had outlived his usefulness in Berlin. Shirer was subsequently tipped off that the Gestapo was building an espionage case against him, which carried the death penalty. Shirer began making arrangements to leave Germany, which he did in December 1940. Shirer smuggled his diaries and notes out of Germany and used them for his Berlin Diary, a firsthand, day-by-day account of events inside the Third Reich during five years of peace and one year of war. It was published in 1941. Historians comparing the original manuscript with the published text discovered that Shirer made many changes, such as covering up his favourable early impressions of Hitler. Much of the text about the pre-1934 to 1938 period was first written long after the war began. He returned to Europe to report on the Nuremberg trials in 1945. During the war Shirer became a director of the Society for the Prevention of World War III, which lobbied after the war for a harsh peace with Germany. 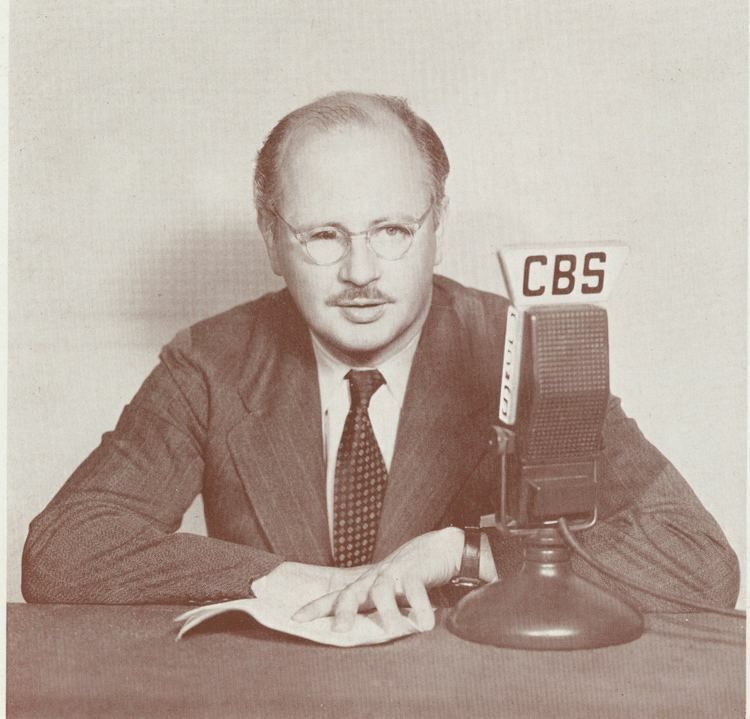 Shirer received a 1946 Peabody Award for Outstanding Reporting and Interpretation of News for his work at CBS. The friendship between Shirer and Murrow ended in 1947, culminating in Shirer's leaving CBS in one of the great confrontations of American broadcast journalism (below). Shirer briefly provided analysis for the Mutual Broadcasting System and then found himself unable to find regular radio work. He was named in Red Channels (1950), which practically barred him from broadcasting and print journalism, and he was forced into lecturing for income. Times remained tough for Shirer, his wife Tess, and daughters Inga and Linda until Simon & Schuster published The Rise and Fall of the Third Reich in 1960. The hardback was reprinted twenty times in the first year and sold more than 600,000 copies through Book of the Month Club alone and a million copies overall. Serialization of a condensed version in Readers Digest and critical acclaim ensured its success in the USA. Fawcett Crest gained paperback rights for $400,000 – a record for the time – and a further million copies were sold at $1.65. It won the 1961 National Book Award for Nonfiction and Carey–Thomas Award for non-fiction. The dispute between Shirer and Murrow started in 1947 when J. B. Williams, a maker of shaving soap, withdrew sponsorship of Shirer's Sunday news show. CBS, through Murrow, who was then vice president for public affairs, and CBS head William S. Paley, did not seek another sponsor, moved Shirer's program to Sunday midday and then stopped producing it, all within a month. CBS maintained that Shirer resigned based on a comment made in an impromptu interview, but Shirer said he was fired. Shirer contended that the root of his troubles was that the network and sponsor did not stand by him because of his on-air comments, such as those critical of the Truman Doctrine, and what he viewed as an emphasis on placating sponsors rather than an emphasis on journalism. Shirer blamed Murrow for his departure from CBS, referring to Murrow as "Paley's toady". The episode hastened Murrow's desire to give up his vice-presidency and return to newscasting. It foreshadowed his misgivings about the future of broadcast journalism and his difficulties with Paley. The friendship between Shirer and Murrow never recovered. In her preface to This is Berlin, a compilation of Shirer's Berlin broadcasts published after his death, Shirer's daughter Inga describes how Murrow, suffering from lung cancer which he knew could be terminal, tried to heal the breach with Shirer by inviting the Shirers to his farm in 1964. Murrow tried to discuss the breach. Though the two chatted, Shirer steered the conversation away from contentious issues between the two men, and they never had another opportunity to speak before Murrow died in 1965. Shirer's daughter also writes that, shortly before her father's death in 1993, he rebuffed her attempts to learn the source of the breach that opened between the two journalists 45 years earlier. Some clues are given in The Nightmare Years (1984), the second volume in Shirer's three-volume memoir, Twentieth Century Journey. Shirer describes the birth and growth of a warm relationship with Murrow in the 1930s. Although his reminiscences are wound together with his version of their professional relationship, he emphasizes that he and Murrow were close friends as well as colleagues. He does not mention their break. A number of touching recollections are included. Thus, it is easy to understand that their break in 1947, based on business disagreements, was made bitter by the close personal relationship they once had. Another aspect of The Nightmare Years is Shirer's description of his and Murrow's three-way relationship with Paley. Shirer says that, in private, he and Murrow were contemptuous of Paley and almost always sided against him in the 1930s. Thus, when Paley and Murrow ganged up on Shirer in 1947, it was a shock, although Shirer does not say so explicitly. The last is a compilation of Shirer's CBS broadcasts (ISBN 1-585-67279-3).